If the screen of iPhone was damaged, how can we retrieve the contacts and messages on the iPhone? As we always have many vital contacts and messages on iPhone, and iTunes can not display them for us. Here, Xilisoft iPhone Transfer is the right solution. This software can display the contents on your iPhone, such as music, movies, photos, contacts, messages, etc. You can backup iPhone files to your computer or iTunes with it. 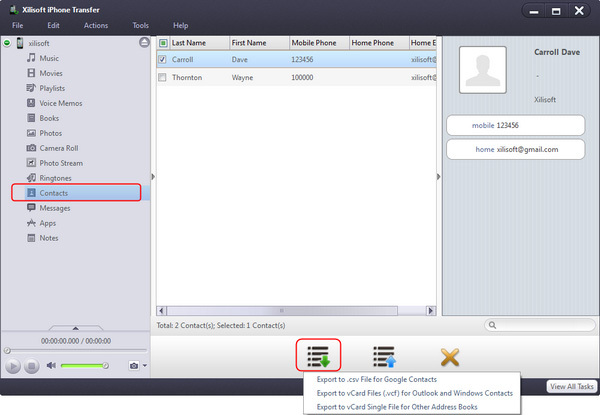 For example, you can export the contacts to .csv file or .vCard file and import the file to your Gmail or Yahoo contacts, export the messages to Text or Html and read the messages as dialogue form. 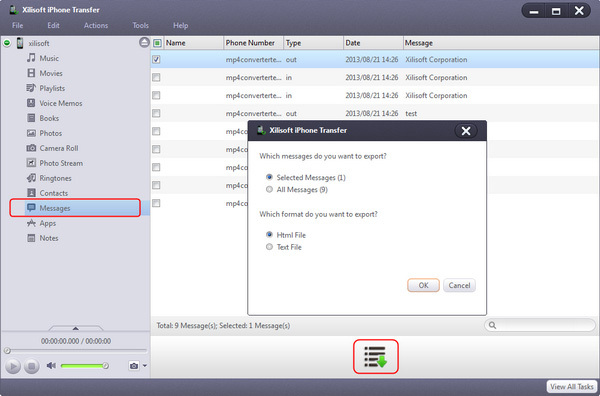 Now let’s focus on how to transfer files with Xilisoft iPhone Transfer. Step 1. Install and run the software. Download Xilisoft iPhone Transfer, install and run it. Connect your iPhone to computer, the application will recognize the device automatically and displays the device information in the interface. In the left directory tree, choose the “Contacts”, and check the contacts in the right list, then click “Export Contacts to Computer” button, choose “Export Selected Contacts to .csv File”, and locate the target folder in the dialog box that appears, then start exporting. Choose the "Messages", and check the messages in the right list, then click "Export Messages" button, choose "Html File" or "Text File" in the opening window and click "OK" button. Besides these, you can also transfer music, movies, photos, apps, notes to your computer with Xilisoft iPhone Transfer.